This can however be customised via the template files and via plugins. Email addresses only – Employers must enter a valid email address for candidates to apply via. Website URLs only – Employers must enter a valid URL for candidates to apply via. Email addresses or Website URLs – Employers can use either of the above. Depending on whats used (URL or email) determines how the “Apply for job” area looks on your site – it will show either a mailto: link, or a website link. job-application-url.php – Outputs the application URL text. 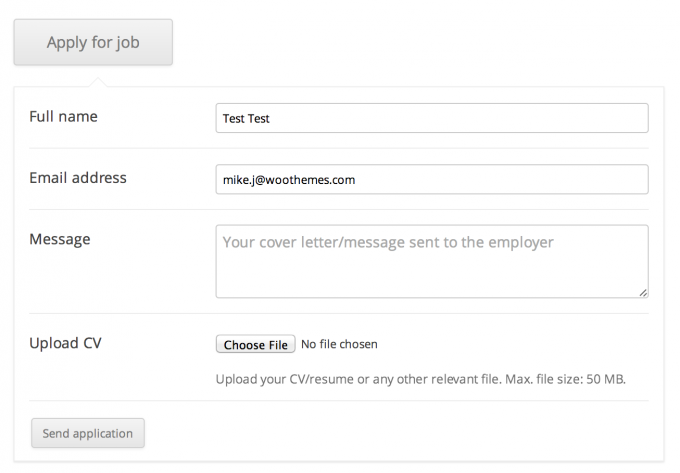 job-application-email.php – Outputs the application email links and text. If you want to have an application form powered by Ninja Forms, Contact Form 7, or Gravity Forms you can use the 3rd party Contact Listing plugin. As Ninja Forms is free, this tutorial will use that. Create a form in Ninja Forms which you’ll use for applications. Common fields to include are name, email, message, and a file input for a resume. Ninja Forms documentation can be found here. Ensure your form contains the required fields for Contact Listings to work – instructions are found in the FAQ. Ninja Forms require a hidden field named “Listing ID” with it’s default value set to “Post/Page ID”. The Job/Resume listing must also have an email address associated with it, not a URL to a website (to enforce this see here). 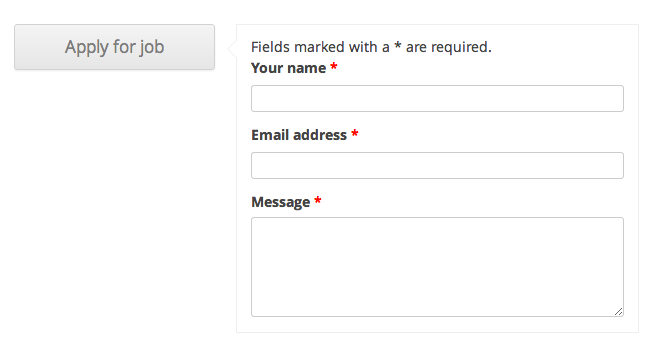 Next, create a new form email notification with the “To” field set to “no-reply@listingowner.com”. Fill the body with the information you want to send to the listing owner. The Job Applications add-on adds a form based application method, and some application management features to WP Job Manager.